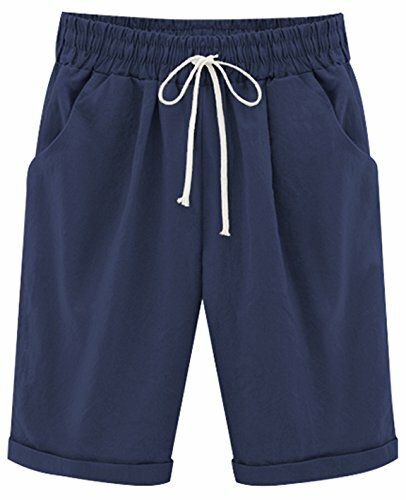 Detail: casual stretch waist shorts with drawstring for a comfortable fit, pleated front. Two slant pockets for convenience and fashion. Suitable occasion: work, holiday, beach,lounge,workout and daily occasions. Rolled cuffs make you more fashionable. (US 6)XS : Waist:26.8"-32.7" Hip: 40.2"-46" Thigh: 22.4" Length: 22.4". (US 8)S : Waist: 28.3"-34.3" Hip: 41.7"-47.6" Thigh: 23.2" Length: 22.8". (US 10) M : Waist: 29.9"-35.8" Hip: 43.3"-49.2" Thigh: 24" Length: 23". (US 12) L : Waist: 31.5"-37.4" Hip: 44.9"-50.8" Thigh: 24.8" Length: 23.6". (US 14) XL: Waist: 33.5"-39.4" Hip: 46.5"-52.4" Thigh: 25.6" Length: 24". (US 16)XXL : Waist: 34.6"-40.5" Hip: 48"-53.9" Thigh: 26.4" Length: 24.4". Pls allow 0.8-1 inches deviations because of manual measurement. to avoid the ripped problem, we suggest to hang on in the shade after wash, don't expose it to the sun, don't dry clean. Comfortable and high quality fabric keep soft and comfy all day.Machine Wash.